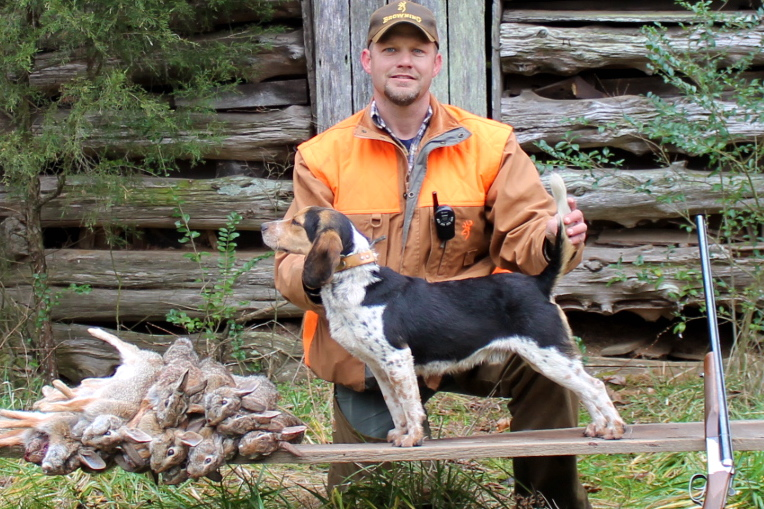 I am putting Puckett Creek’s TN Driver up for stud as he is a top-notch rabbit hound that I believe deserves consideration for your breeding program. Driver comes from a long line of well-known reproducers. He is solid and well-rounded in the field with no glaring faults. 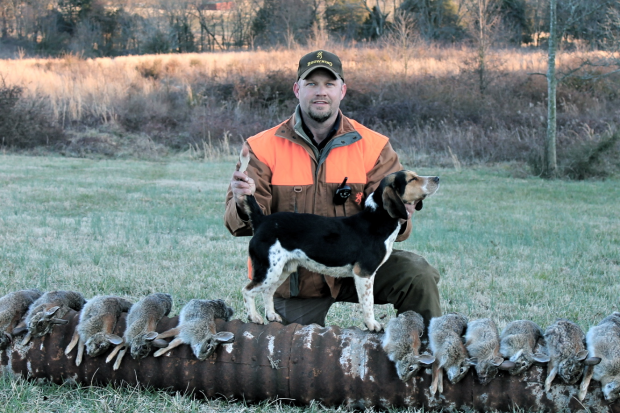 Driver hunts hard, jumps rabbits, explodes out of the check area, and is the type of hound that will literally kill himself to get at the rabbit. He is a rabbit’s worst nightmare! He can run the front with composure and power, but more often is seen gutting a high energy pack from the second or third spot. He is certainly not perfect, but is a workhorse with all-day stamina that gets the job done in the field and under the gun. He was very easily broken of deer, and he hasn’t had an e-collar on in the field since he was a puppy. He also retrieves rabbits, as did his dam. Driver is 3 1/2 yrs. old (d.o.b. 8/1/09), is AKC registered and is approx. 14 1/4″ tall. He has a coarse, deep mouth that stands out in any pack. He has already been bred a handful of times and has pups doing well in TN, GA, New Hampshire, KY and VA. Here are a few clips of Driver in the field thrown together to give you an idea of his mouth, speed and ability in the field. 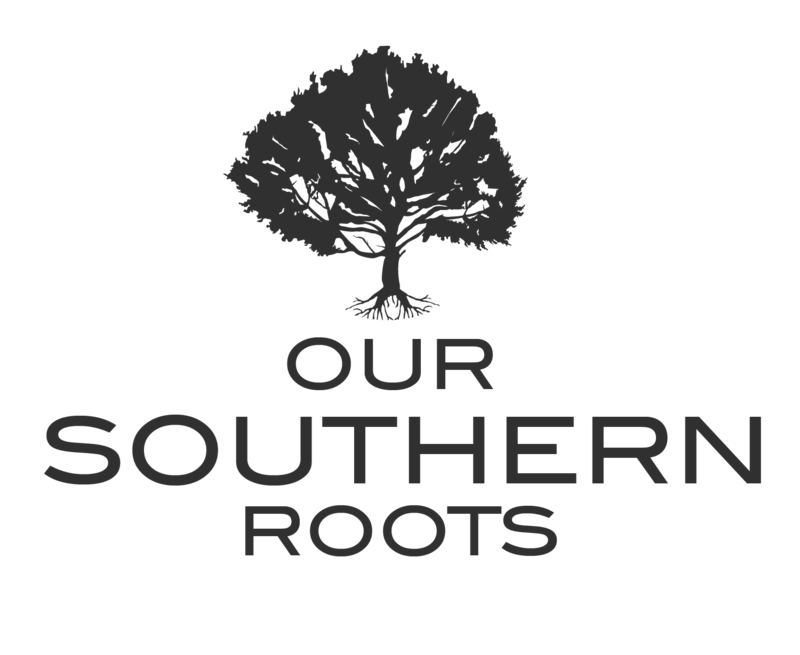 Richard – we are in Rutherford Co., not far from you. Thanks for you interest in Driver, he is an outstanding gun dog with plenty of foot! Let us know when your female comes in and we’ll line up a breeding. Thanks! Richard- very nice looking rabbit hound. have an a-1 gyp gun dog deluxe. would love to breed to him sometime. I believe it would make an excellent cross. please call my no. is 1-606-573-7507 thank you very much for putting such a fine looking stud dog up for betterment of the breed. god bless and best regards Anthony smith.